Changing the way we cook our food can have a dramatic effect on our health. If we make wiser choices with our food and the way we cook it, we can significantly reduce our risk of contracting cancer and heart disease. 1. Invest in non stick pans - With quality non-stick pans you can get away with not using oil at all or by using a low fat cooking spray. You can also 'fry' some foods in a little water to prevent them sticking. If you have to use oil, use olive oil and pat food with kitchen roll after cooking to remove excess oil. 2. Look through your recipes collection for diet recipes and low fat recipes. Cook them in batches and freeze so that you always have a healthy meal option available. 3. Steam or stir-fry vegetables - Cooking them using these methods will help the vegetables to retain their nutrients, color and taste. Look for healthy recipes like Chinese stir-fries and invest in a wok and steamer. You can buy Chinese bamboo steamers, which just sit on top of a pan of boiling water, or you can buy electric steamers. You can get a good electric steamer for less than the cost of one meal out and the ease of use is a real time saver. 4. Use olive oil - Replace other oils or a fat with olive oil which is mono-unsaturated oil and actually helps to reduce cholesterol. You must visit at www.dishadvice.com. Make your own salad dressings from olive oil and balsamic vinegar to give your salad a Mediterranean taste and this will be lower in fat than commercial salad dressings. 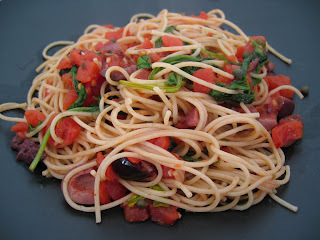 Search online for free recipes using olive oil. Some muffin recipes use olive oil or corn oil instead of solid fats. 5. Use fat free milk in cooking and baking to cut the fat content of your healthy recipes. 6. Replace fat in baking - Look for low fat recipes for cakes and biscuits or replace half the fat in recipes with pureed prunes, yogurt or mashed banana. Search for diet recipes for sweet treats. 7. Use fat-free yogurt or crème fraise instead of using cream for pouring on dessert recipes or fruit. 8. Add more vegetables to casseroles and soups and use fresh or frozen vegetables rather than canned. 9. Don't add salt to food - Season food with herbs, spices, and garlic and lemon juice instead of salt. 10. Trim visible fat off meat and use lean meat in your low fat recipes. Cut down on how much red meat you consume and replace with fish and chicken or turkey. Remember, cooking and eating healthy food is not hard work and definitely not expensive. If you play your cards right you can change you whole family's diet and they won't suspect a thing. That isn't to say that they won't notice anything though, because they will - they may well notice that they are losing weight, feeling better and getting fewer minor illnesses. If that isn't reason enough to try out a few of these tips, I don't know what is!